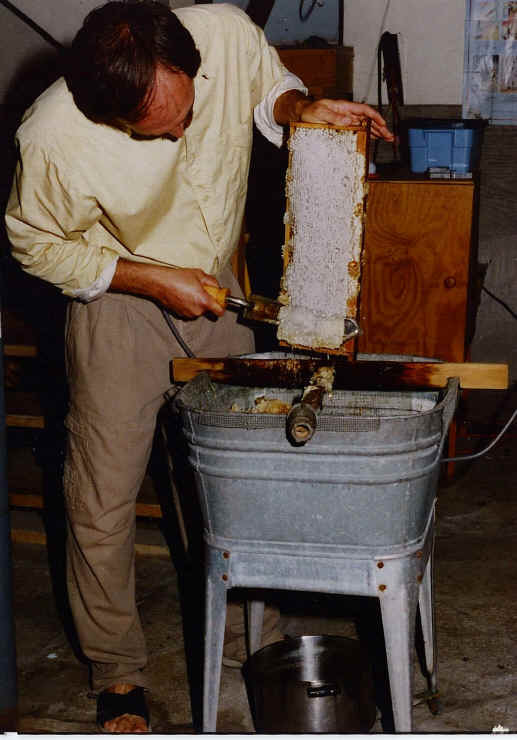 Mark began beekeeping in the late 1980's because he loved to eat honey, and considering how much of it he ate, decided he might as well raise it himself. It has turned into his most interesting hobby, one which captures the curiosity of many guests. 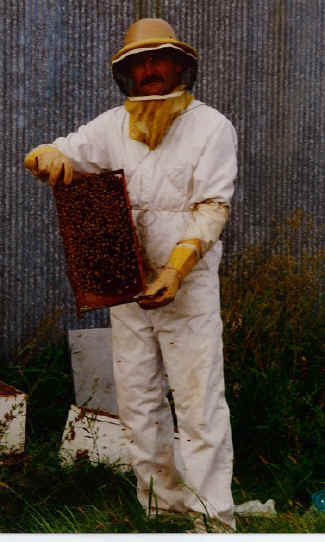 His 'Bee Happy Honey Co.' normally maintains 9-12 hives. Guia uses the honey extensively for cooking, consuming ~100 pounds per year. On an average year we harvest ~700 pounds of honey. 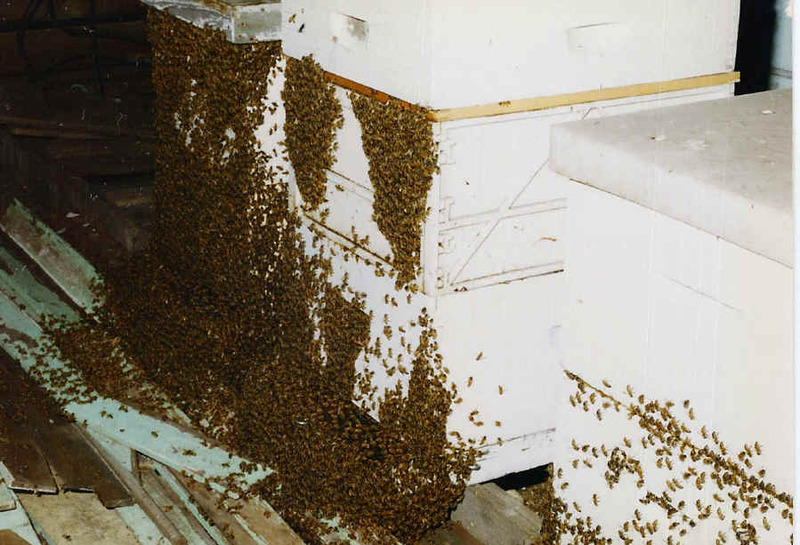 In Illinois, honey is produced primarily in the months of May-July. Mark extracts honey in July - September. If you visit in one of those months and your timing is good, you may have a chance to witness (or help with) the extraction process. 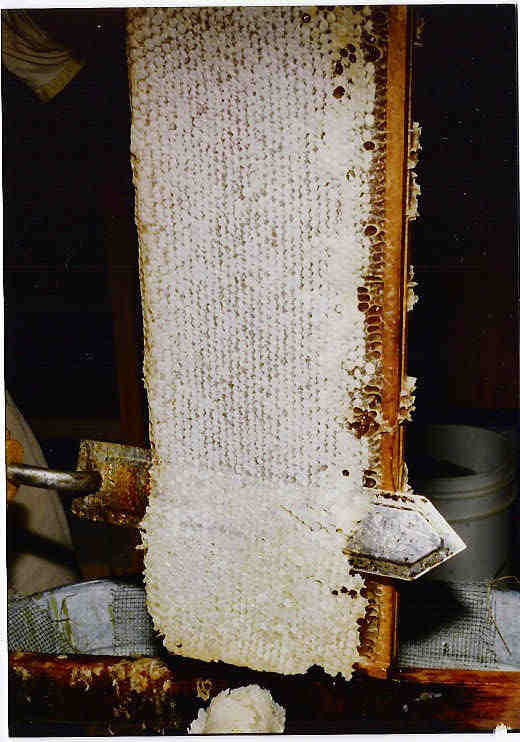 Mark does not heat or filter his honey, thus allowing it to maintain its desirable enzymes. Mark is always happy to answer any questions about beekeeping as well as show you the bee equipment (without the bees, of course) or sell you some honey. He normally has 5 lb., 3 lb., 2 lb., and 1 lb jars for sale. It makes a great gift. 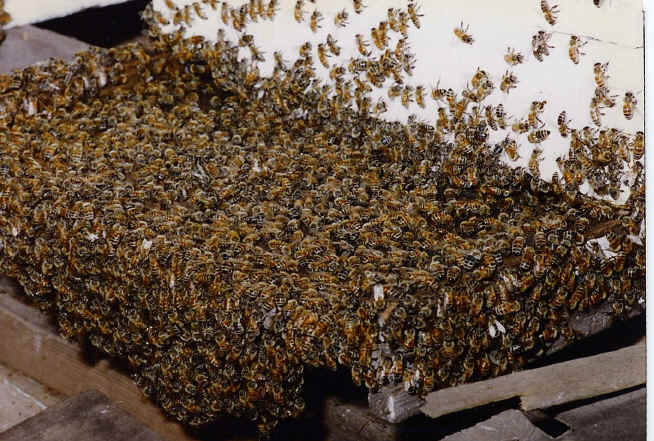 Beekeeping in the U.S. is no longer the simple hobby it was in the late 1980s. Accidental introduction of two species of Eurasian bee mites has taken a toll on bee populations, wiping out nearly all the wild honey bees. Because of this, managed bees are needed for crop pollination. Our honey bees, therefore are dual purpose, you may see a few as you stroll the gardens. The Healing Power of Honey - amazing article on the healing power of honey! Thank you so much for a wonderful stay. We enjoyed visiting your beautiful house and the wonderful conversation. We learned a lot. Being a rather young couple, it is good for us to see how others make for themselves wholesome, healthy lifestyles. We couldn’t do all you do here in Chicago but we might try one or two things. We are especially grateful for your generosity. Experiencing the wonderful food and seeing your land was a priceless experience. Hope you are continued to be blessed in your endeavors. Thank you very much for being so welcoming to our family. We enjoyed dinner which was wonderful and breakfast which was extremely scrumcious! Ryan & I loved our room and Mom and Michael loved theirs. You run a wonderful bed & breakfast and we will definitely come back. The bee seminar was so interesting and it seems like a great hobby. I hope you continue it for many years. Thank you again.